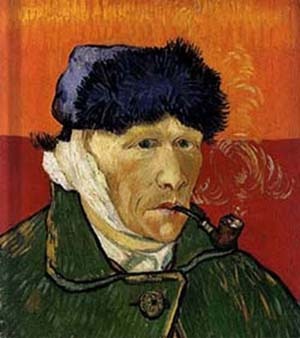 In a catalogue of works from the private collection of Mary and Leigh Block of Chicago, IL, the first painting that one sees is an iconic work by Vincent van Gogh, the result of an unfortunate absinthe-laced binge which led to the legendary self-mutilation of the chronically depressed visionary Dutch-born artist's right ear. 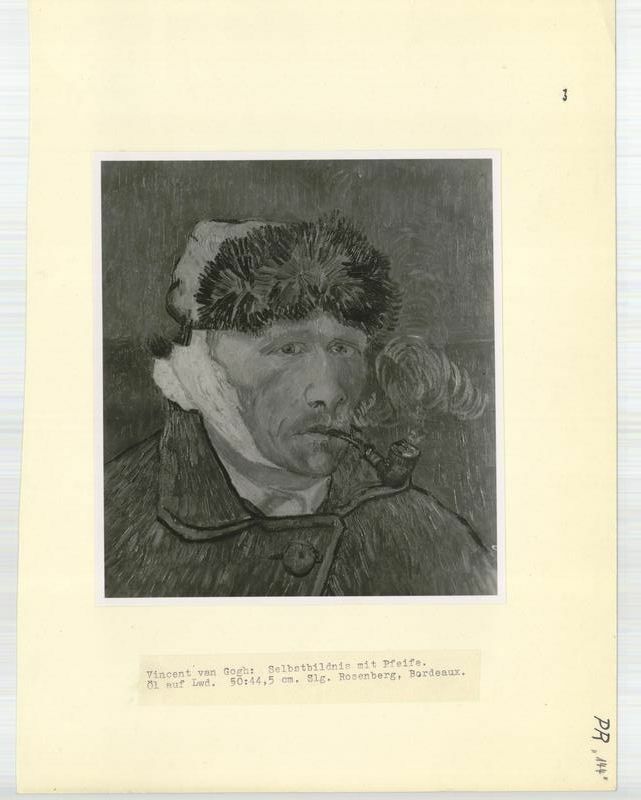 Known as the “Dutchman Smoking a Pipe [Hollandais à la Pipe]” or « l’homme à l’oreille coupée », the Block catalogue merely refers to it as « Self-Portrait, » which ironically is also the title given to it by the art historical staff of the Einsatzstab Reichsleiter Rosenberg (ERR) in 1944. As is so typical of art catalogues, no hint of a work’s peculiar history is provided, especially when it involves something so egregious as a Nazi-organized theft. And yet, it was exhibited at Boston’s Museum of Fine Arts from February 2 to April 14, 1968. Van Gogh’s “Self-Portrait”, executed in 1889, one year before his suicide, belonged to the world-class Parisian art dealer, Paul Rosenberg. In a preventive move to safeguard most of his priceless collections of modern works of art from the vagaries of an inevitable continental war in 1939-1940, Rosenberg shipped the works to various locations in the southwest of France, including a château that he had rented at Floirac and a bank vault at the Banque Nationale pour le Commerce et l’Industrie (BNCI) at Libourne. The “Self-portrait” was stored, unframed, at Libourne and bore Rosenberg’s inventory No. 2215. Following the Nazi takeover of half of France in May-June 1940, a specialized unit of German agents, informed by unscrupulous Paris-based art dealers, appeared at the BNCI branch in Libourne to remove more than 160 works belonging to Paul Rosenberg. 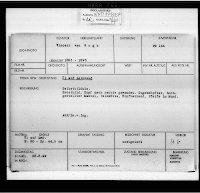 They were first taken to the German Embassy's Paris depot on rue de Lille before being transferred to a storage area at the Louvre which had been set up to accommodate the initial seizures made by the Einsatzstab Reichsleiter Rosenberg (ERR) as well as those conducted by police units answerable to the German Ambassador, Otto Abetz. Alois Miedl, one of Hermann Goering’s preferred bankers and intermediaries in illicit art acquisitions, was most famous for his role in the Aryanization and seizure of the Goudstikker Collection in Amsterdam. 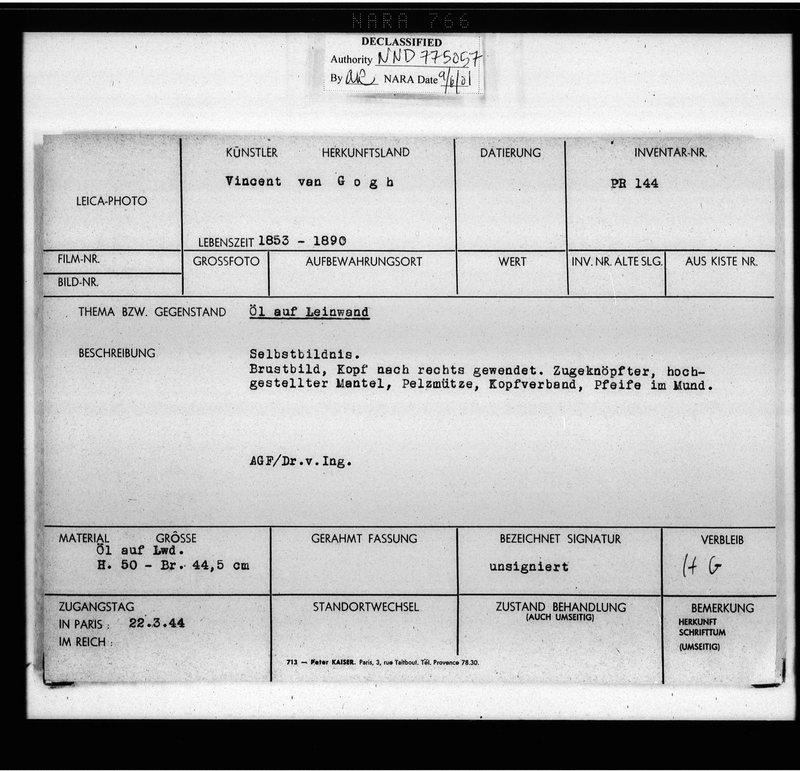 His relationship with Goering entitled him to gain access to choice pieces stolen from French Jewish collections including van Gogh’s “Self Portrait.” Together with a dozen other modernist works, Miedl shipped the stolen paintings to Switzerland by way of the German diplomatic pouch and the crate containing them was placed at the Volksbank in Zurich under the care of a Dr. Wiedekehr. Subsequent to Miedl’s arrest in the late summer of 1944 as he tried to cross the Franco-Spanish border with his family, Allied intelligence operatives located the stolen works that he had sent covertly to Switzerland, leading to their eventual repatriation to Paris and subsequent restitution to Paul Rosenberg. The only concrete evidence that we have of the painting’s presence at the Jeu de Paume is the card that the ERR staff typed under the number PR 144 as well as the photograph taken of the work. The next time this painting is ever exhibited, the public might be interested in knowing the tortuous path that it followed from Paris to a bank vault in Libourne and from there to the German Embassy on rue de Lille, the Louvre, the Jeu de Paume, and finally Zurich, before returning to Paris and ultimately sold to a Chicago-based family. What lies at the heart of HEART?